Denmark, officially the Kingdom of Denmark, is a Nordic country and the southernmost of the Scandinavian nations. Denmark lies southwest of Sweden and south of Norway, and is bordered to the south by Germany. The Kingdom of Denmark also comprises two autonomous constituent countries in the North Atlantic Ocean: the Faroe Islands and Greenland. Denmark proper consists of a peninsula, Jutland, and an archipelago of 443 named islands, with the largest being Zealand, Funen and the North Jutlandic Island. The islands are characterised by flat, arable land and sandy coasts, low elevation and a temperate climate. Denmark has a total area of 42,924 km2 (16,573 sq mi), land area of 42,394 km2 (16,368 sq mi), and the total area including Greenland and the Faroe Islands is 2,210,579 km2 (853,509 sq mi), and a population of 5.8 million. Norway, officially the Kingdom of Norway, is a Nordic country in Northwestern Europe whose territory comprises the western and northernmost portion of the Scandinavian Peninsula; the remote island of Jan Mayen and the archipelago of Svalbard are also part of the Kingdom of Norway. The Antarctic Peter I Island and the sub-Antarctic Bouvet Island are dependent territories and thus not considered part of the kingdom. Norway also lays claim to a section of Antarctica known as Queen Maud Land. Frederiksborg Castle is a palatial complex in Hillerød, Denmark. It was built as a royal residence for King Christian IV of Denmark-Norway in the early 17th century, replacing an older castle acquired by Frederick II and becoming the largest Renaissance residence in Scandinavia. Situated on three islets in the Slotssøen, it is adjoined by a large formal garden in the Baroque style. As king he wanted to show his power as absolute monarch through architecture, and dreamed of a Danish Versailles. He was the first to use the 1671 Throne Chair of Denmark, partly made for this purpose. His motto was: Pietate et Justitia (With piety and justice). The Palace of Versailles was the principal royal residence of France from 1682, under Louis XIV, until the start of the French Revolution in 1789, under Louis XVI. It is located in the department of Yvelines, in the region of Île-de-France, about 20 kilometres southwest of the centre of Paris. The Throne Chair of Denmark is the physical representation of the Throne of the Kingdom of Denmark and of the Throne of the Kingdom of Norway. Skåneland or Skånelandene (Danish) is a region on the southern Scandinavian peninsula. It includes the Swedish provinces of Blekinge, Halland and Scania. The Danish island of Bornholm is sometimes also included. Skåneland has no official recognition or function and the term is not in common usage. Equivalent terms in English and Latin are "the Scanian provinces" and "Terrae Scaniae" respectively. The term is mostly used in historical contexts and not in daily speech. In Danish, Skånelandene is used more often. The terms have no political implications as the region is not a geopolitical entity but a cultural region, without officially established political borders. The Scanian War was a part of the Northern Wars involving the union of Denmark–Norway, Brandenburg and Sweden. It was fought from 1675 to 1679 mainly on Scanian soil, in the former Danish provinces along the border with Sweden and in Northern Germany. While the latter battles are regarded as a theater of the Scanian war in English, Danish and Swedish historiography, they are seen as a separate war in German historiography, called the Swedish-Brandenburgian War. Christian Albert was a duke of Holstein-Gottorp and bishop of Lübeck. Christian V introduced Danske Lov (the Danish Code) in 1683, the first law code for all of Denmark. He also introduced the similar Norske Lov (Norwegian Code) of 1687 to replace Christian IVs Norwegian Code from 1604 in Norway. He also introduced the land register of 1688, which attempted to work out the land value of the united monarchy in order to create a more just taxation. During the reign of Christian V, Denmark’s trade in cattle that had declined due to catastrophic fires and wars has been restored, and livestock and crop exports have also surpassedFrederick III, with thousands of cattle entering and leaving Jutland through the Oxen Way. After entering and fattening in the Danish King’s German enclave County of Oldenburg，the castle reached the big market in Wedel. From there, cattle are resold to all parts of North Germany via Stade, Hamburg and Lübeck. As the population continues to soar at the end of the seventeenth century, demand for beef, grains and fish is increasing, both throughout North Germany and on the Baltic coast alone. In terms of the number of livestock shipped to the South, in 1680 each market had reached 40,000 cattle. Traditional export commodities, including fish and grains, have increased their exports since the beginning of the seventeenth century. The agricultural products exported by Denmark, especially cattle, have made a lot of money from Germany and the Netherlands for the Danish royal family, the aristocrats and the town residents.During his reign, science witnessed a golden age due to the work of the astronomer Ole Rømer in spite of the king's personal lack of scientific knowledge and interest. 1670–1699His Majesty the King: By the Grace of God, King of Denmark and Norway, the Wends and the Goths, Duke of Schleswig, Holstein, Stormarn and Dithmarschen, Count of Oldenburg and Delmenhorst. Count Peder Griffenfeld was a Danish statesman and royal favourite. He became the principal adviser to King Christian V of Denmark from 1670 and the de facto ruler of the dual kingdom of Denmark-Norway in the first half of the 1670s. In 1673 he was appointed as Chancellor of Denmark, elevated to count, the highest aristocratic rank in Denmark-Norway, and received the Order of the Elephant, the country's highest order. At the behest of his enemies at court, Griffenfeld was arrested in early 1676 and convicted of treason, a charge that historians agree was false. He was imprisoned for 22 years, mainly at Munkholmen in Norway. Jarlsberg was a former countship that forms a part of today's Vestfold county in Norway. Jens Juel was a Danish diplomat and statesman of great influence at the Danish court. He was created Baron and granted Juellinge in 1672 and also established Juellund in 1694. He was the brother of Admiral Niels Juel. Ulrik Frederik Gyldenløve, Count of Laurvig was the leading general in Norway during the Scanian War, whose Norwegian leg is conventionally named the "Gyldenløve War" after him. He was an acknowledged illegitimate son of King Frederick III of Denmark and Norway. The Count's Feud, also called the Count's War, was a war of succession that raged in Denmark in 1534–36 and brought about the Reformation in Denmark. In the international context, it was part of the European wars of religion. The Count's Feud takes its name from the Protestant Count Christopher of Oldenburg, who supported the Catholic King Christian II, deposed in 1523, over the election of Christian III, a staunch Protestant who had already implemented Lutheranism as the state religion in Schleswig and Holstein in 1528. Sophie Amalie of Brunswick-Lüneburg was queen of Denmark and Norway as the consort of the King Frederick III of Denmark. She is known for her political influence, as well as for her cultural impact: she acted as the adviser of Frederick III, and introduced ballet and opera to Denmark. Charlotte Amalie of Hesse-Kassel was queen-consort of Denmark and Norway by marriage to King Christian V.
Princess Frederica Amalia of Denmark was the second daughter of King Frederick III of Denmark and Sophie Amalie of Brunswick-Lüneburg, and Duchess of Holstein-Gottorp from 1667 to 1695 as the consort of Duke Christian Albert. Sophie Amalie Moth, Countess of Samsøe was the officially acknowledged royal mistress of King Christian V of Denmark. Together they had five acknowledged illegitimate children, all of whom bore the surname Gyldenløve. In 1677 she was elevated to be the first Countess of Samsø. 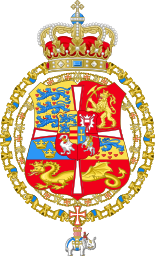 The still-existing Danish noble family of Danneskiold-Samsøe is descended from her. Christian Detlev, Count von Reventlow (1671–1738) was a Danish military leader and diplomat. 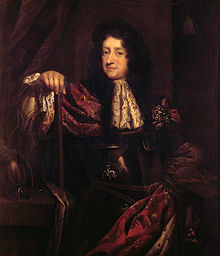 Conrad, Greve von Reventlow was a Danish statesman and the first "Grand Chancellor of Denmark", a predecessor title of the Prime Minister of Denmark, from 1699 until his death. His chancellorship occurred during the reign of King Frederick IV. The Peace of Lund, signed on 16 September (O.S.) / 26 September 1679, was the final peace treaty between Denmark-Norway and the Swedish Empire in the Scanian War. Denmark–Netherlands relations are foreign relations between Denmark and the Netherlands. Denmark has an embassy in The Hague and the Netherlands has an embassy in Copenhagen. Both countries are full members of NATO and the European Union. 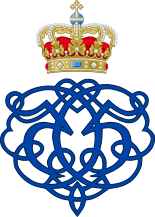 Princess Beatrix is a Dame of the Order of the Elephant since 29 October 1975. On 31 January 1998, King Willem-Alexander of the Netherlands also received the Order of the Elephant. Duke Augustus of Schleswig-Holstein-Sonderburg-Plön-Norburg was Duke of a small part of Schleswig-Holstein around Nordborg Castle on the island of Als. He was the founder of the Schleswig-Holstein-Sonderburg-Plön-Norburg line. ↑ Written by the Frederiksborg's historian staff on the official website of the institution. 1 2 3 "Christian V." (2007). In Encyclopædia Britannica. Retrieved 9 January 2007, from Encyclopædia Britannica Online. ↑ Jespersen, Knud J.V. The Introduction of Absolutism Archived 11 August 2006 at the Wayback Machine . Gyldendal Leksikon, quoted by The Ministry of Foreign Affairs of Denmark, on Denmark's official web site. 1 2 3 Nielsen, Kay Søren (1999). 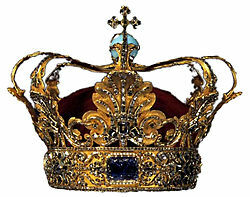 Christian V – Konge og sportsmand. The Royal Danish Arsenal Museum, Net Publications, 1999. 1 2 Upton, Anthony F. (1998). Charles XI and Swedish Absolutism, 1660–1697. Cambridge University Press, 1998. ISBN 0-521-57390-4. ↑ Jespersen, Knud J.V. Denmark as a Modern Bureaucracy Archived 11 August 2006 at the Wayback Machine . Gyldendal Leksikon, quoted by The Ministry of Foreign Affairs of Denmark, on Denmark's official web site. Wikimedia Commons has media related to Christian V of Denmark . Wikisource has the text of the 1911 Encyclopædia Britannica article Christian V. .